Rollover is the term used to describe moving from one year (decision period) to the next. A Rollover will process your currently entered decisions for the year ahead. Rollovers in the Single-Player are manually controlled by you. The Single-Player is designed for you to familiarize yourself with the simulation and test your decisions before the Multi-Player begins. 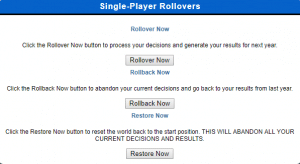 From the Single-Player Rollover menu, you are able to rollover into the next decision period/year, rollback or reset the decision periods as you wish in order to test and change your decisions. Some courses will have a limit on the maximum number of Rollovers, or restrictions on Rolling back and Restoring in the Single-Player. Rollovers in the Multi-Player are processed automatically on pre-set dates determined by your Instructor. Before each of these scheduled times, you or your team must have all of the decisions for the Year Ahead entered into your Multi-Player company before the rollover is processed. 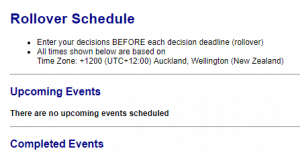 From the Multi-Player Rollover Schedule menu, you will be able to view the upcoming scheduled events for your course, and the completed events. If you are using MikesBikes Advanced, you may have a Double Rollover scheduled for the Multi-Player phase of your course.